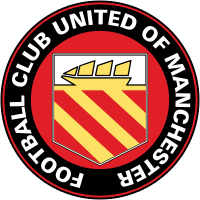 Chester won their first away game since September with a fantastic rearguard victory over FC United. They led at the break through Anthony Dudley, but were reduced to ten men when George Green was sent off for a second bookable offence. However, they defended valiantly and wrapped it up in stoppage time through Captain Gary Roberts. Their was two changes from the 0-0 draw against Southport on New Year’s Day which saw Danny Livesey and Cain Noble come in for Matty Waters and Deane Smalley. In a game that struggled to get going, the Blues should’ve taken the lead on eight minutes. Excellent pressure from Anthony Dudley and Craig Mahon on Lloyd Allinson in the FC United goal resulted in him gifting possession straight to the Irishman – but he rushed his shot and it trickled the wrong side of the post. It wasn’t goalless for much longer though as Chester took the lead on 16 minutes through Anthony Dudley. Chester continued to apply pressure on the FC United defence and that resulted with possession finding its way out to Craig Mahon who floated a cross into the FC United penalty area from the left. Dudley rose highest and headed the ball beyond Allinson in the United goal – who should’ve done better. On 31 minutes the Blues could have doubled their lead. The first corner of the game was taken by Dan Mooney and it found the returning Danny Livesey at the back post but he couldn’t keep it down and it remained 1-0. Six minutes later a shot from distance by Mooney dipped awkwardly and bounced in front of Allinson – who made a save at the second attempt. In the second half Chester brought on Lloyd Marsh-Hughes for Cain Noble. FC United started the second period on the front foot and should have been level on 50 minutes. First an effort from distance by Chris Sharp looked for the world it would end up in the back of the net but for a strong hand from Grant Shenton, then moments later Chris Lynch hit one on the volley and it cannoned back off the post and out to safety. Matty Waters became the second change of the afternoon for the Blues as he replaced Dan Mooney on 65 minutes. Moments later a huge moment in the game as George Green who was already on a booking was shown a second yellow and sent off for a foul on Chris Lynch. On 75 minutes another superb save from Shenton to denied Kurt Willoughby’s rasping drive from the edge of the penalty area. 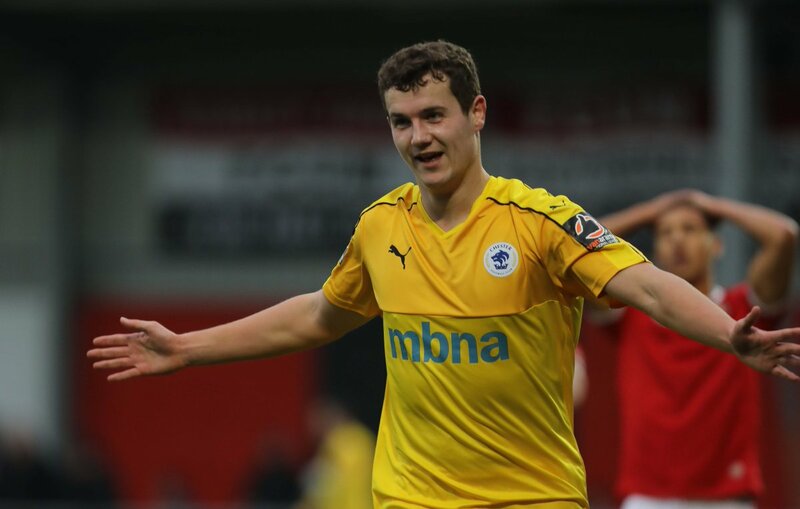 As the ten man Blues battled to maintain their slender lead – FC united continued to press and a goalmouth scramble almost resulted in United levelling the score but nobody in Red could put the ball in the Chester net. As five additional minutes were a lofted Chester on the counter killed FC United off and made it 2-0. Superb work from Dudley picked out 17-year-old Marsh-Hughes who did brillIantly to keep his cool and put it on a sixpence for his captain Gary Roberts who drilled it beyond Allinson and sent the travelling Blues fans into delirium. As the final whistle blew it meant that the Blues were victorious on the road for the first time since September. It wasn’t pretty but Chester dug deep on a cold Saturday afternoon in Greater Manchester and came away victorious. 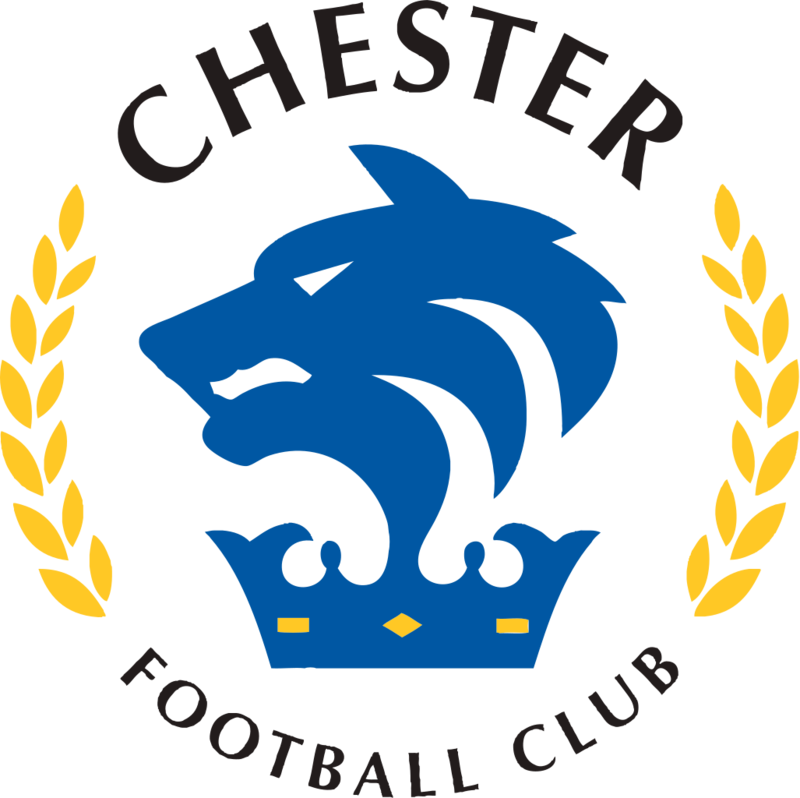 Chester FC: Shenton, Noble (Marsh-Hughes 46), Grand, Roberts (c), Livesey, Howson, Jackson, Green, Dudley, Mahon (Moran 85), Mooney (Waters 65) Subs: Smalley,Murray.